The goal for this series of laboratory designs is to teach not only how to manage the PIC32 processor to solve engineering design problems, but also how to produce dependable (validated) and sustainable (verified) software using best design practices. To that end, Unit 1 will begin by introducing engineering concepts that are important in developing these best practices. Although some of these concepts may seem trivial at first, they are important in measuring the ability of a system to meet design requirements and specifications, and will be implemented throughout Units 1-7. How to develop a plan for a software-based microprocessor design. Understand the management of basic microprocessor digital inputs and outputs. Write an application that utilizes the Basys MX3 processor platform to perform basic calculator functions and display the results on a 4-digit 7-segment LED display. Become familiar with the circuits included on the Basys MX3 PCB. Fundamentals of digital combinational and sequential logic. Understand best practices for creating dependable and sustainable software. Know how to generate a microprocessor development project using MPLAB X. Know how to generate a config_bits file for the PIC32MX370 processor. 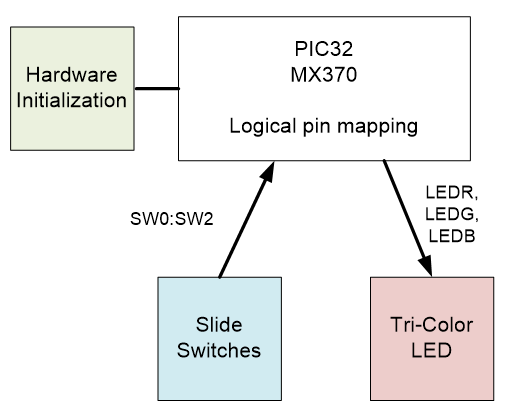 Know how to configure the Microchip PIC32 processor pins as either digital inputs or outputs. Understand the drive capability of a processor digital output. Know how to write a C program for a specific application using an embedded system. Know how to make speed performance measure on a processor-based system. A software-based system consists of a collection of electrically interconnected electronic hardware components, some of which require programming using a computer language. Software-based system design is an engineering effort and requires a good process to obtain good results. The life cycle of system development uses a series of activities that, when considered in proper order, minimize design effort and achieve maximum benefit using the available resources of the software-based system. Coding is one of the last phases when developing software-based systems. There are many methods and tools available today to assist in code development planning. Not all software applications require exotic planning tools, although all applications do require some degree of planning. After my 25 years of teaching a course on microcontrollers, the most common mistake I have seen students make is writing code before they completely understand the problem. Even a simple plan helps to guide the developer to design a system that meets the stated requirements. Table 6.1 provides an outline of minimal tasks to complete the design process as is commonly done in industry. The first step is to have a complete understanding of the requirements or specifications. In other words, state in common human language what it is that the final design will do. Although the life cycle process appears to be a single pass, the final phase often results in cycling through the entire process numerous times to ensure that the delivered system meets the customer’s expectations. In all lab exercises of this series, the purposes and requirements will be defined by a problem statement. In most labs, the required hardware is provided on the Basys MX3 trainer board. In some instances, additional hardware such as motors will be needed. Software development will be the focus of the design phase for this series of labs. A significant amount of effort will be needed to understand the required resources of the PIC32MX370 processor along with the functionality of sensors, actuators, displays, and controls used in each lab, as well as the interconnection of these I/O devices to the PICMX370 processor. This includes application specific hardware, interconnection drawings, development tools, and testing instrumentation. Part of processor resource allocation is a table that designates the processor I/O pins and special functions such as timers, communications, and analog I/O. During the design phase, the developer must consider how the system will be tested or validated. Frequently, this requires identifying hardware instrumentation test points and test code that must be integrated with the system code. Concept maps are used as a mechanism for describing design plans. Figures 6.1 and 6.2 represent two common concept maps used in software engineering. Figure 6.1 is a data flow diagram (DFD) that describes the system as a collection of elements that transform inputs and outputs. The DFD is very useful in system partitioning to help identify minimum dependency and interaction between portioned elements. Software and hardware engineering use the divide and conquer approach that divides a large problem into a series of small tasks that are easier to complete. For software engineering, this requires partitioning the problem into single-purpose functions that can be tested independently of other single-purpose functions. There are two common approaches to partitioning: those based on hardware such as I/O devices or processor peripherals and partitions based on software functionality so that minimum interaction with or dependency on other partitions is necessary. Figure 6.1. Data flow diagram - partitioning base on IO resources for Lab 1a. Figure 6.2. Control flow diagram for Lab 1a. A control flow diagram (CFD), as the one shown in Fig. 6.2, describes the order in which the transactions occur. The CFD is useful when integrating the portioned elements in defining the order in which they are executed. One should be able to determine where each line of software code is executed on the CFD graph. The CFD is also useful during the testing phase to ensure that a scenario can be generated that causes the execution to transverse each path through the CFD. Using the divide and conquer approach, each element in the partitioned project must be completely tested and validated before integrating it with another element. You don’t want to design new code based on the functionality of incorrectly functioning old code. It is a waste of time. After integration of all partitioned elements, system tests determine how well your design effort satisfies the stated requirements. One of the most straightforward ways is to make a table of the specified requirements to serve as a check-off list to include in your final documentation. There are two lab assignments associated with this unit. Lab 1a is very limited in scope and complexity and focuses on defining the PIC32MX370 I/O pins as digital inputs or outputs in a tutorial-like fashion. Lab 1b is more open-ended and asks the student to extend the knowledge gained in Lab 1a by using the slide switches, push buttons, and the 4-digit 7-segment LED display on the Basys MX3 trainer board to implement a basic calculator. Both labs emphasize the engineering approach to embedded system design. The reader is expected to have acquired the basic knowledge of programming a computer in C. But as a review, we offer web links to an online C Tutorial and Microchip MPLAB X IDE. Figure 8.1 illustrates a typical hardware configuration for microcontroller development. The workstation computer can be running any Windows®, MAC®, or Linux® operating system. The developer writes the program code on this workstation using the editor provided by the MPLAB X IDE or a third party editor such as NotePad++®. A cross compiler converts the C programs into a binary representation of the code that the PIC processor can execute. The file generated by the compiler is downloaded to the target application processor with the aid of a programmer/debugger module (included on-board the Basys MX3). Figure 8.1. Integrated Development Hardware Diagram. The diagram in Fig. 8.1 shows the Basys MX3 unit. The Basys MX3 has a built-in programmer/debugger that allows a direct connection from the development workstation computer to the Basys MX3 board. If the programmer/debugger is not built into the hardware platform, a separate programmer is required, such as the PICkit 3 or a chipKIT Programmer. For optimal processor performance, include the instruction SYSTEMConfig(SystemClock, SYS_CFG_WAIT_STATES | SYS_CFG_PCACHE); in the initialization portion of the main function. The parameter, SystemClock, is set to 80,000,000 by the “config_bits” file. If you are using “plib.h” functions, XC32 rev. 1.4 will generate numerous warnings concerning the obsolescence of the plib functions. These warnings can be suppressed by adding the following definitions to the top of the main.c file. Table 8.1 below, reproduced from the MPLAB XC32 C/C++ Compilers User’s Guide, notes that the legacy library option is automatically selected for new projects. 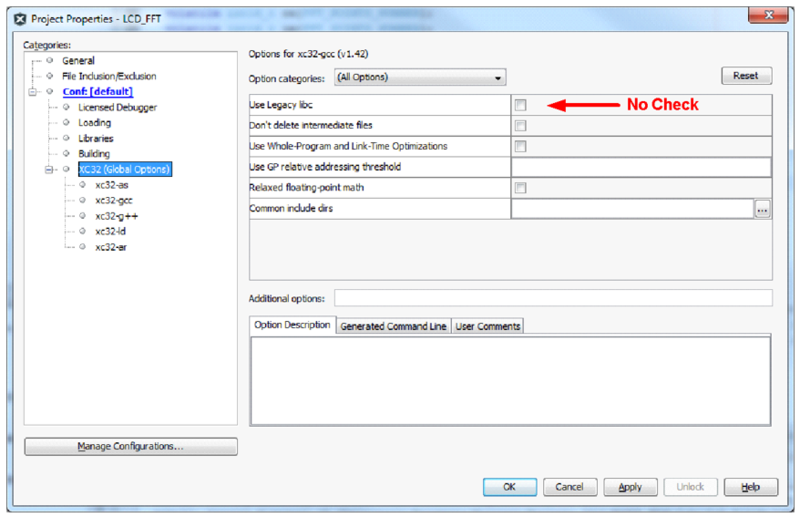 If using MPLABX 3.40 or later, when starting a new project, this option must not be checked, as shown in Fig. 8.2. Table 8.1. XC32 (Global Options) all Options Category. Figure 8.2. Disable “Use Legacy libc” to use plib.h. Only the 8 individual LEDs labeled LD0 through LD7 are connected to contiguous I/O port pins (see Table E.1 for Port A pins 0 through 7). These are the only I/O pins that may be set as a group. All other pins must be individually assigned. The dispersion of pins and ports for common elements such as switches, buttons, and segment LEDs requires a bit-banging approach rather than reading or setting a group of bits with a single instruction. Microcontrollers have three major resources: time access to the central processing unit (CPU execution time), program and data memory, and input and output (I/O). Frequently, an application requires more of one of these three resources than the selected processor can provide. Microprocessor resource management involves compensating for a lack of one of these resources using excess capability in one or both of the other two. For example, if an application requires more I/O than the processor has I/O pins, the designer can implement a parallel pin multiplexing scheme that reduces the number of I/O pins but requires additional memory and CPU time to execute the code. This concept will be explored when we interface the PIC32 processor with a 4-digit 7-segment LED display. Open the MPLAB X application on your workstation computer. Start a new Microchip Embedded Standalone Project. Right-click on the Header Files and select “New” → “XC32 Header.h”. Name this file “config_bits.h”. Click on “Windows” → “PIC Memory Views” → “Configuration Bits”. Set the options as shown in Listing B.1 in the Appendix. Click on “Generate Source Code to Output”. Enter “CTRL A” to highlight the text in the output window and “CTRL C” to copy the text. Double-click on “config_bits” under the Header Files tab to open that file in the editor window. Delete lines 21 through 173 of the automatically generated code. Change the three instances of the text “_EXAMPLE_FILE_NAME_H” to “_CONFIG_BITS_H”. Position the cursor to the blank line – line 21. Enter “CRTL V” to paste the config_bits text to the config_bits.h file. Enter “CTR_S” to save the newly generated file to the project folder. Make the appropriate edits to the automatically generated header comments. Once a config_bits.h file is generated, it can be copied to other projects without needing to complete steps a through j. Generate a main function: All projects must contain a function called “main”. Right-click on Source Files and select “New” → “C Main File..”. Name this file “main.” and the extension set to “c”, so it will be “main.c”. #include “config_bits.h”. Other header files may be required. Declare local functions other than the function main. Add a main function code as shown in Listing A.1. The return denotes an EXIT FAILURE because embedded systems code should never exit from the function main because it inherently has no place to return to. Complete the project requirements by adding header and source files as elements of building blocks. Each source file should have a header file that declares constants and software function prototypes that are used as interfaces with other project files. The project work is divided into independently testable units that can serve as libraries for other projects that use the same hardware resources. For example, writing a decimal number to a 4-digit 7-segment display is a common operation. Hence, a set of source-header files will be written to display a 4-digit number. // this line of code. Summary:	Set configuration bits for the PIC32MX370F512L processor. Description: 	The configurations settings set the processor to have a core frequency of 80MHz and a peripheral clock speed of 10MHz. Listings C.1 and C.2 that are provided below initialize the Basys MX3 hardware inputs. Development time will be reduced by including these two files in future projects. The hardware.h header file contains an extensive use of macro instructions. Macro instructions are text replacement compiler directives that can result in better documentation and all but eliminate magic numbers, which are a well-known programming bad practice. Macro instructions can obfuscate code and can make it difficult when debugging; however, when properly used, macro instructions can improve documentation and facilitate code portability. The macro instructions used in the hardware.h header file are simple definitions, conditional compilation, and ternary operations all designed to improve readability of the code. Basys MX3 trainer boards switches, push buttons, and LEDs. "Trainer" boards switches, push buttons, and LEDs. * range 0 through 15. * wait state and enable prefetch cache but will not change the PBDIV. * The PBDIV value is already set via the pragma FPBDIV option above..
settings into a single variable. This section is not required to complete Labs 1a and 1b; however, it contains information important to forming a more complete view of microprocessor I/O. Digital input and output is one of the most basic functions as a microprocessor can perform. A simplified block diagram of the control of an I/O processor pin is shown in Fig. D.1. 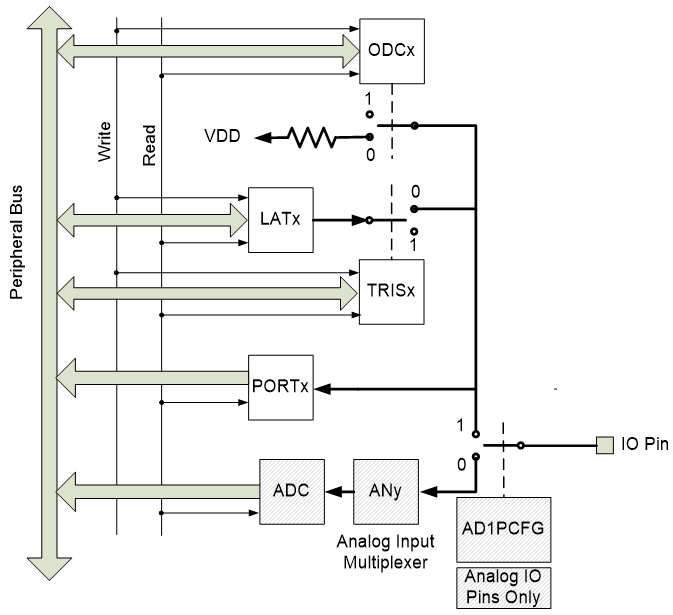 The operation of the I/O pin is configured by bit values in the following four registers: the output drain control (ODC), the output latch (LAT), the output tri-state (TRIS), and, for pins that can be used for analog inputs, the analog-to-digital input configuration (AD1PCFG). Minimally, the TRIS registers must be set to configure a processor I/O pin as an input or output by setting the bit in the register to 0 for output or 1 for input. By default, all pins that can serve as an analog input are configured to be so. Any analog input pin that is to be used for digital I/O must also be designated to be a digital I/O pin by clearing the appropriate analog select pin. The PIC32MX370 processor has five registers that are used to designate dual-functioning pins as digital or analog inputs. For example, the instruction to clear the analog select pin for PORT D bit 1 (RD1) is “ANSELDbits.ANSD1 = 0;“. If the bit in the TRIS register is set low to make the I/O pin to function as an output, the voltage pin can be set high by writing a 1 to the appropriate bit in the LAT register. Setting the LAT register bit to a zero sets the output pin low (0V). The actual voltage at the output pin depends on the setting in the ODC register. The default configuration has all bits in the ODC register set to zero, which means the output can both source (supply output current) and sink (pull outputs low) current. If the bit in the ODC register is set high, then the output pin functions as open drain, which can sink current but not source current. The maximum current capability of each conventional I/O pin is 15mA (sink or source), while the combined current of all I/O pins is 200mA subject to total power constraints. I/O pins have both open drain and active source output capability. The open drain capability provided by the ODC register is useful when interfacing with switch array keypads (see Pmod KYPD for an example keypad device). The outputs that drive the four LEDs on the Basys MX3 board are limited to approximately 5mA. The PORT register allows the state of pin to be read regardless if the pin is configured in the TRIS register to be an input or an output. If the voltage on the pin is above the high input threshold, the PORT bit is read as a logic one. Various processor pins have different thresholds. If you are interested, refer to Table 30-8 of PIC32MX330/350/370/430/450/470 data sheet to determine the high and low thresholds for the pins being used. All digital input-only pins are 5V tolerant, meaning that a device that outputs 5V for logic high can be connected to digital input pins and will not damage the PIC32MX processor. For the PIC32MX7370, the maximum voltage that can be applied to I/O pins that can be used as either analog or digital I/O is VDD+0.3V, or 3.6V. Exceeding this voltage limit will damage the processor. The following listings are two functionally equivalent examples of code that uses the input state of pin RD0 to set the output on RD1. Table E.1. Processor IO Assignments.